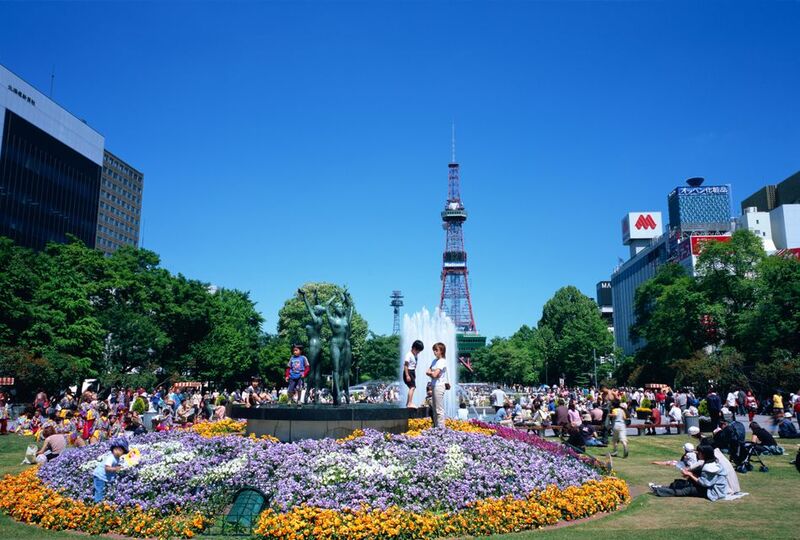 a relatively young city and is, therefore, lacking in much traditional Japanese architecture-- it is a beautiful, spacious city, full of parks and wide boulevards, with a thriving culture and plenty to see. It's undisputed most-famous ambassador-to-the-world is the eponymous brewing company, which makes its home in Sapporo. Admission to the beer museum is free, though you won't find much in English. Sapporo's Tokeidai, clock tower, is an iconic symbol of town, which looks strangely like something one might find on a Nebraskan farm. If you're planning a trip to the area, attempt to coincide with the Sapporo Snow Festival, held the first week in February. The ice sculpture competition draws artists from all over the world to Sapporo for a chance to show their talent; be sure to stroll through Odori Koen-- the sight of the sculpture contest-- at night for a real treat: the finished sculptures are lit beautifully, creating an incredibly surreal winter wonderland. A comparatively new and relaxed city in Japan, Sapporo is the big city of Hokaiddo, known for its beer and serving as host to the winter Olympics. I visit in march. but it was snowing. I went to sapporo TVtower. and I saw night view. it was so beautiful. there was a lot of snow. about 120miter from way. i was buried under the a lot of snow. Shiraoi Ainu Village - also known as "Porotokotan", the design of the museum as an outdoor museum is divided into modern and village zone. Inside a house, explanations of Ainu history and culture are given and traditional dances are performed at all times of visitors. Sapporo got 3 beer factories , there are Sapporo, Kirin and Chitose. The urban center of Hokkaido and a transit point for most people visiting the region. Sapporo is known for its excellent food and the famous snow festival. A pleasant city with relatively wide boulevards and friendly people. With excellent beer and outstanding ramen and seafood (crab and salmon especially, though it'll hurt your wallet), Sapporo is synonymous in the mind of many Japanese with eating, but it's also an attractive city of parks with an outstanding Winter Festival where the northern character of the city really shines. Best of all, unlike much of Hokkaido, it's directly accessible on the JR system, by overnight train from Tokyo. This is my favorite city in Japan so far. It's not as crazy busy as Tokyo and has similar shopping and entertainment. It's urban, lively and fun. The city is known for its Snow Festival in February. I really want to come back and experience it. Great noodle houses! They are known for ramen in this Northern city great soba too! A great city with a lot of activities. Very convenient to get around. An astonishing combination of amazing sights, good food, interesting culture, colorful history and great people! A place which you can visit all-year-round. From blossom to snowflake, every season bears distinctive attractions that make your trip memorable. The hotspring is also what-you-can't-miss. What's more, it is the origin of Sapporo beer.